First ascent on May 19. 2000. How to get there: The mountain summit is located at 76.23.442 north, 26.20.078 west. This is a GPS measurement at the summit. Route description: The mountain has an easy route from the glacier in north-west. Comments: The ascent on May 19. 2000 was a first ascent. A cairn was built at the summit. 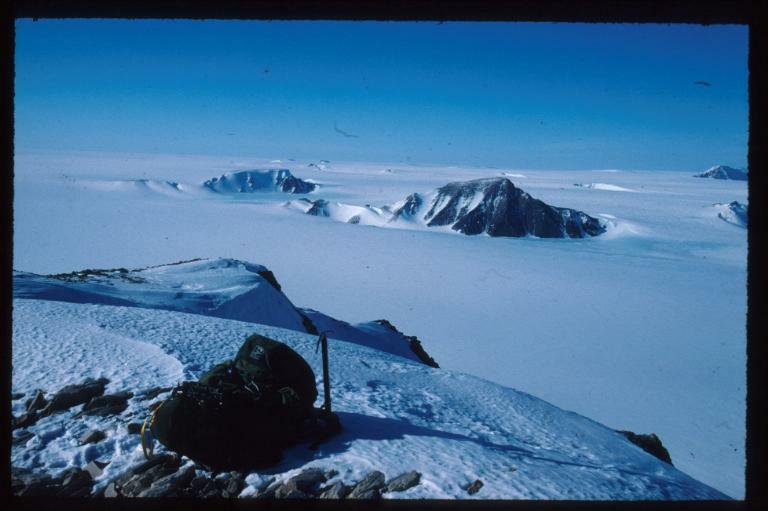 This mountain is among the highest in Dronning Louise land and the highest climbed by our expedition. The mountain was quite close to our Base Camp, see pictures below. Air photo of the Base Camp area with several of the nearby mountains. 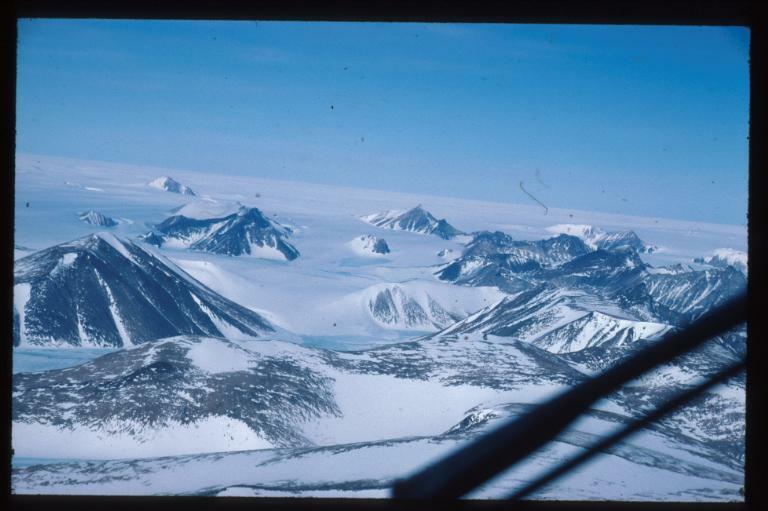 The picture is taken from the Twin Otter shortly before landing. 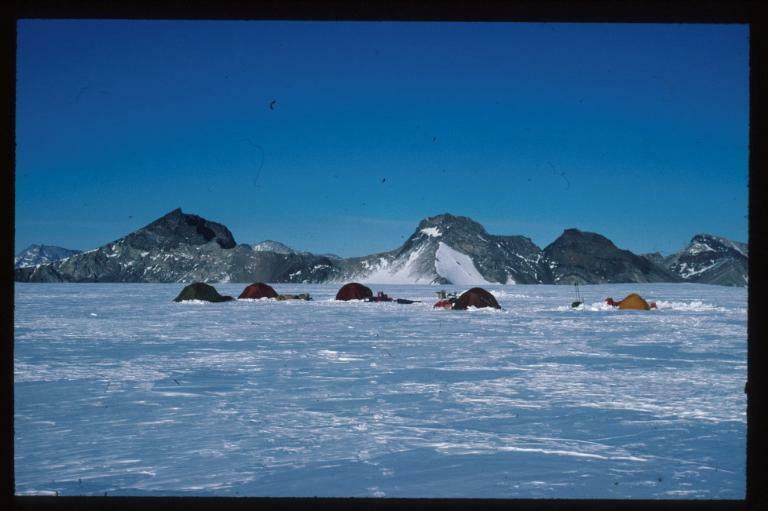 The nunatak furthest to the left (behind the large mountain to the left) is ICEsoft. 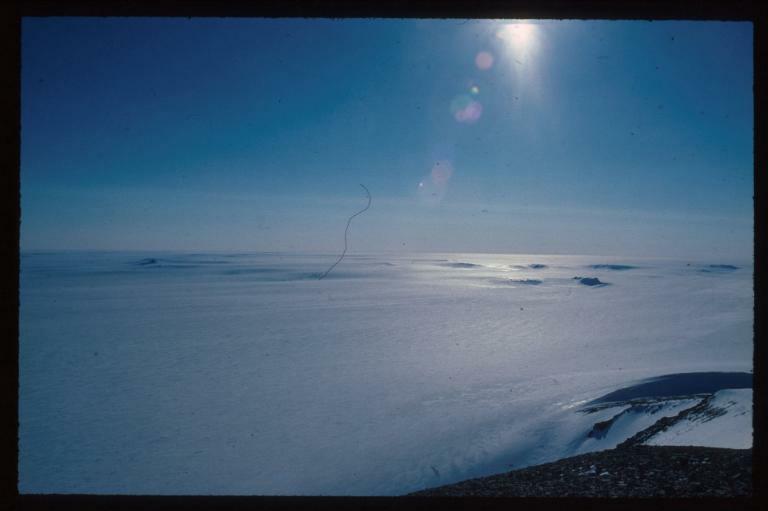 The nunatak furthest out on the icecap to the right of ICEsoft is Punktum. The mountain with a snow ridge on this side of Punktum is TWMC Fjeld. 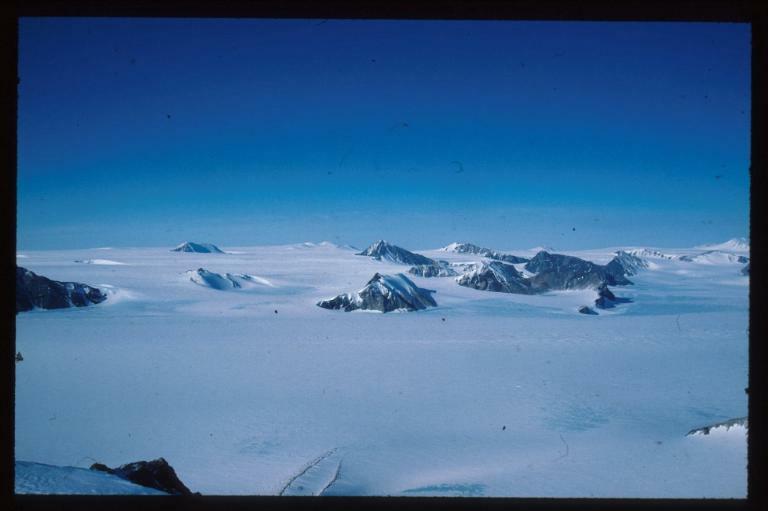 The small nunatak on the glacier in the middle is Mid-Gletcher, behind it to the right is Dickens Bjerg. 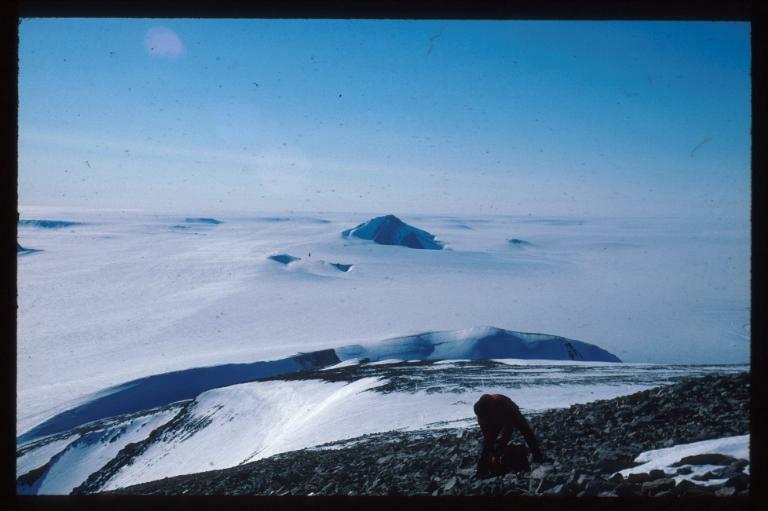 The rounded top in the foreground (with a patch of snow just right of its summit) is Cheops. The Base Camp was located on a line from Mid-Gletcher to Dickens (but closer to Dickens). 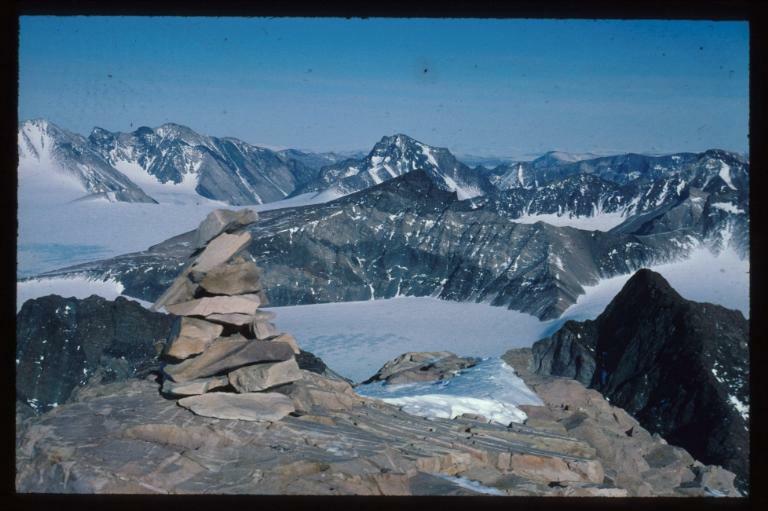 The white mountain near the icecap and right (north) of Dickens is Falkoner Klippen, while the rocky mountain just on this side is Helgoland. The long ridgeline that ends in a summit directly in front of Helgoland is Hvalross Fjeld. First cairn built on Dickens Bjerg. The view is east. Stob Coire an Lochain (2110 m) (very flat on the north slope) is the mountain behind the first Glacier. Note the relatively steep passage right next to the rock ridge. 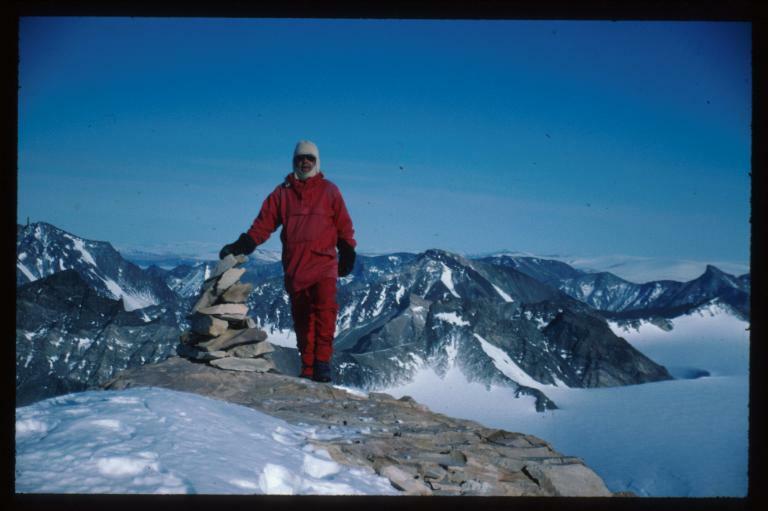 The darker peak below to the right was attempted by John Starbuck and Paul, but not climbed all the way to the summit due to extremely loose and bad rock. This peak has an impressive rock wall facing the glacier behind. Base Camp with Stob Coire an Lochain (2110 m) behind to the left. Punktum seen from Dickens Bjerg. View north from Dickens The mountain in the center is Aonach Mhòr, 1960m. View to Helgoland (right) and Falkoner Klippen (left) from Dickens. Me at Dickens Bjerg May 19th, 2000.